Saturday's Penny Edition Stakes is set to be a sensational race lead by local hopes Mio Dio and Casino Wizard, while classy interstate visitor He or She will be looking to get his season off to a flying start. Please note that the Gawler & Barossa Jockey Club Jump outs scheduled for Tuesday 19th September have been re-scheduled for Monday 18th September 2017. Trainers and industry participants are reminded that Arsenic is a prohibited substance under the Australian Rules of Racing, above a threshold level of 0.30 milligrams per litre in urine. After four Stakes wins last season and the first of the new season aboard Mio Dio, Todd Pannell is keen to keep his good form rolling. More of the state's best horses stepped out at trials this morning as they look to make their presence felt at home and across the border this spring. The final team lineups for next weeks Australia vs Ireland Jockey Challenge have been announced with some of Australia's most in-form jumps jockeys representing Australia. In an exciting announcement for the Gawler & Barossa Jockey Club, we are delighted to welcome Holdfast Insurance Brokers as new naming rights partner of the Gawler Cup for the next three years. A sensational edition of the Group 3 Spring Stakes will be headlined by the five-time Group 1 winner Lankan Rupee. TRSA wish to advise that in consultation with the Naracoorte Racing Club the meeting scheduled for Sunday 20th August 2017 has been abandoned due to the current condition of the track and impending weather forecast for the remainder of the week. Please note this meeting will not be rescheduled. Annual prizemoney for racing in South Australia will top $40 million for the first time following the latest boost announced by Thoroughbred Racing SA. The annual Scott’s Group of Companies Mount Gambier Gold Cup will now be held on Friday 1 December, before the track undergoes a $3.3 million redevelopment. Some of the state's most promising gallopers had a hit out at Gawler this morning as they look towards kicking off their campaigns in the spring. Five winners in two meetings has Krystal Bishop in the form of her life and enjoying every moment. Following the confirmation of a successful application to the Federal Government’s Building Better Regions Fund (BBRF) initiative, Thoroughbred Racing SA has today announced a $989,000 development of a new Racing and Community / Function Centre at Bordertown. Kylie Mckerlie will be looking to go back to back in the BHP Roxby Downs Cup when she saddles up Eigelstein in Saturday’s feature. 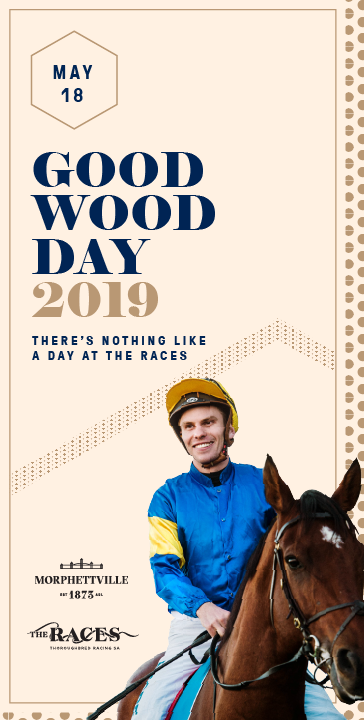 This Saturday is Jockey Celebration Day, a national day to celebrate the achievements of former and current jockeys, commemorate those who have lost their lives and raise awareness and funds for the National Jockeys’ Trust to help support injured or ill jockeys and their families. TRSA wish to advise that in consultation with the SA Trainers Association an additional race has been added to Gawler on Wednesday 9th August 2017. Race 9 $15,000 Three & Four Year-Old Class One Handicap 1100 metres Nominations Close 12 noon Thursday 3rd August 2017.